HOW MANY SACRED MONTHS ARE THERE? WHY ARE THESE MONTHS SACRED? WHAT IS ASHURA ? WHAT IS ITS HISTORY? another report narrated by Muslim adds: " … in thanksgiving to Allah, so we fast on this day." According to a report narrated by al-Bukhari: " … so we fast on this day to venerate it." According to another report also narrated by al-Bukhari: "He said to his Companions: 'You have more right to Musa than they do, so fast on that day.' "
WHEN IS ASHURA ? WHICH DAY OF MUHARRAM? 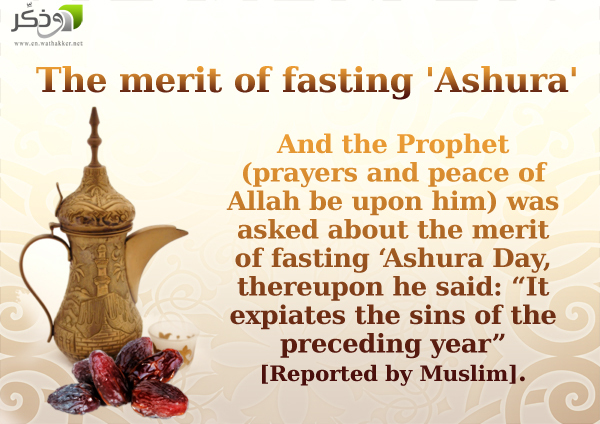 Note : Some scholars regard it as ok to fast on Ashura only. However, in accordance to the above hadeeth it is the duty of Muslims to differ from the Jews and obey the wish of Rasool (s.a.w). However, if in case one fails to do so, then scholars have not criticized it. The above ahadeeth explains the seriousness of fasting either alone on Friday or alone on Saturday. Shaikh Albani (r.h) , after reviewing the ahadeeth of prohibition mentioned above, is of the opinion to leave the fast of Ashura if it falls on a friday or saturday because of the principle of Fiqh " If prohibition is in opposition to allowance then prohibition takes precedence over allowance"
As one can read, Al Mujaahid (r.h) was a Makkhi, at-Tawoos Ibn Kaysan (r.h) was a Yemeni , an-Nakha'ee (r.h) was a Koofi and Khaalid ibn Ma'dan (r.h) was from as-Shaam. This means that 4 senior Taba'een widespread at 4 different major areas supported the prohibition of fasting on Saturdays unless it was an obligatory fast (such as ramadan or etc). Shaikh ul-Islaam in Iqtidah Sirat al-Mustaqeem transmitted from some companions of Imam Ahmad who disliked the voluntary fasting on Saturdays. Also Excluded from this prohibition is one who fasts the day before or after, or if it coincides with days that he habitually fasts, such as one who fasts al-Ayyaam al-Beed (the 13th, 14th and 15th of each hijri month), or who has the habit of fasting a specific day such as the Day of ‘Arafat, and it coincides with a Friday. From this it may be understood that it is permissible for a person who has vowed to fast on the day when So and so returns, for example, or the day when So and so recovers from sickness, to observe that fast if that day happens to be a Friday. (See Fath al-Baari by Ibn Hajar). (ii) the wish of rasool (s.a.w) to fast a day before Ashura in order to be different from the jews In sha Allah. And this is the only solution to prevent falling into a doubtful matter or sinning.